At an event in New York City on Monday, Jeb Bush joked about his future political plans, as well as what may be in the cards for former New York City Mayor Rudy Giuliani. “There's been a lot of speculation about what may happen in the future, and I've been candid that I'm weighing my options," Bush said. In today's photo of the day, we see astronaut Steve Bowen in training as NASA says it's working on plans to send astronauts into space to land on an asteroid. 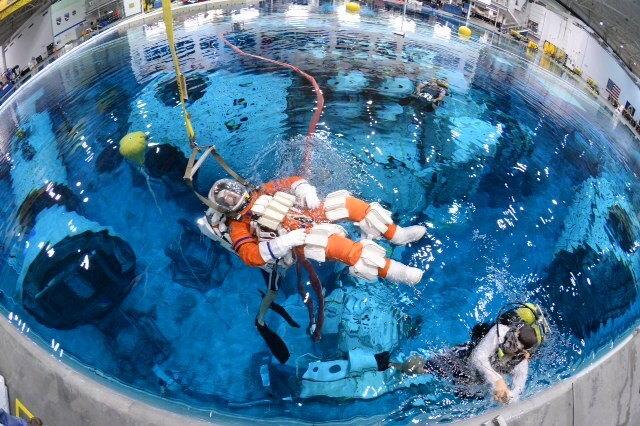 Though the mission isn't planned to take place until the 2020s, that isn't stopping astronauts from simulating an asteroid landing in a 40-foot-deep swimming pool at a Space Center in Houston. Remember a few years ago scientists believed that drinking red wine and eating chocolate would help us all to live longer? Well, a new study looking at the impact of resveratrol, an antioxidant found in grape skin and dark chocolate, says that it may not be the fountain of youth so many people hoped it would be. Dr. Suzanne Steinbaum of Lenox Hill Hospital in New York City says these findings should let people know things like dark chocolate and red wine can be incorporated into a fuller Mediterranean diet, but don't count on them to be your magic source of health and vitality. "There is never, ever going to be that one pill that's going to change everything and make you healthy," Dr. Steinbaum says. Researchers from Johns Hopkins University and the University of Barcelona tracked 783 men and women aged 65 or older. They used urine samples to measure resveratrol levels every 24 hours for nine years. Results showed resveratrol levels did not have a substantial influence on heart disease, cancer, inflammation, or longevity. Dr. Steinbaum adds context saying it's important to note they talked about the Western diet. "The Western diet in itself is not healthiest thing in the world, so that's significant," she says. The "French Paradox" may be what started all the hype around red wine years ago. It is a hypothesis that says that resveratrol intake, through heavy wine consumption, is the reason the French have low rates of cardiovascular disease, despite a diet rich in fatty foods. Basically, the French drink lots of red wine, therefore they are healthy, despite all the cheese and baguettes they enjoy too. This new research doesn't overturn the "French Paradox" altogether, as Dr. Steinbaum says other chemical compounds in red wine and chocolate could still offer health benefits. For people who don't get the antioxidant resveratrol in their diet, they may look to supplements. Dr. Steinbaum said Americans spend $30 million per year on these extras. With this new study, she suggests "stop wasting your money." However, incorporating antioxidants that can be found in items like cocoa and berries are great for you as part of a balanced, Mediterranean diet, Dr. Steinbaum says. But the best health advice she can give? Eat everything in moderation, and get out there and sweat. "People who are losing weight, what are they doing?" she asks. "They're going out exercising ... You've got to do the work." Need to get today's top stories on-the-go? Watch Don Lemon's morning minute now!